Jungfraujoch station is marketed as the “Top of Europe” by Jungfraubahn who operate the line and is the highest main line railway station in Europe. The platform lies at an altitude of 11333 feet or 3454m above sea level and is reached by a fascinating tunnel through the solid rock of the Eiger. The station reminds one of an underground town with shops and restaurants for those who have any money left after buying their ticket and for those who don’t – provides access to the wonderful winter world of the high plateau at the top of the Aletsch Glacier between the 4000m peaks of the Monch and the Jungfrau. The sublime mountain views are free. The last time I’d been here a blizzard had raged across the high mountains and my walk to the Monchsjoch Hut had become something of an adventure in arctic conditions. Even the huskies that give dogsled rides to the tourists had all been indoors. Today though as I emerged from the tunnel the conditions were a little more benign than last september – the sun shone from a deep blue sky, warming the snowy plateau to a balmy three degrees above freezing and the wind was presumably battering some poor hiker in the Scottish Highlands or some other far off place. The station had been busy today so I’d made good my escape even resisting the temptation of the Indian restaurant – these are a rarity not to be passed up in Switzerland – and even though the 26 franc price tag for my favorite dish did not put me off the queue did! The gently rising trail to the Monchsjoch Hut lies for just over a mile across a permanently snow covered glacier and is pisted in the same way as a ski run as well as being marked by poles. The track is crevasse free but not so the surrounding glacier so it is important to stay on the path if you are not roped up and remember that you are walking on ice and not solid rock. These ice fields are amazingly up to 800 metres thick in places and feed the Aletschgletscher – the longest glacier in the Alps at 22 km or nearly 14 miles. Today I passed several people making their way to the hut who appeared to be struggling. It was the snails pace and zombie like expressions that told me who had come straight up from the lowlands without being in the hills recently. I’d been walking to around 2500m the day before and was still short of breath – these people clearly hadn’t ventured above Interlaken until today. 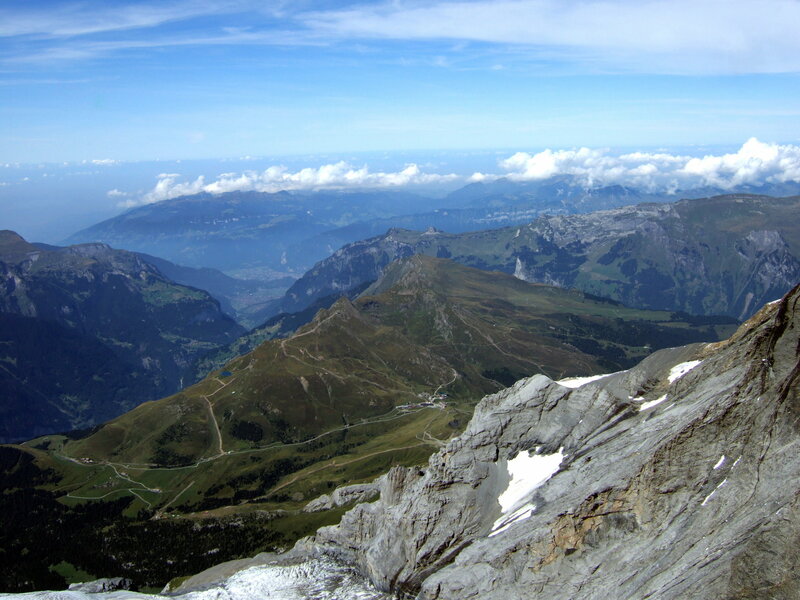 The town’s at about 500m while the Jungfraujoch is 3450m and the Monchsjoch 3650m – a height that passenger aircraft are required to be pressurised or carry breathing oxygen – a little acclimatisation is certainly desirable before coming up here, if you want to enjoy it that is! I watched as one group turned back apparently exhausted for the station. 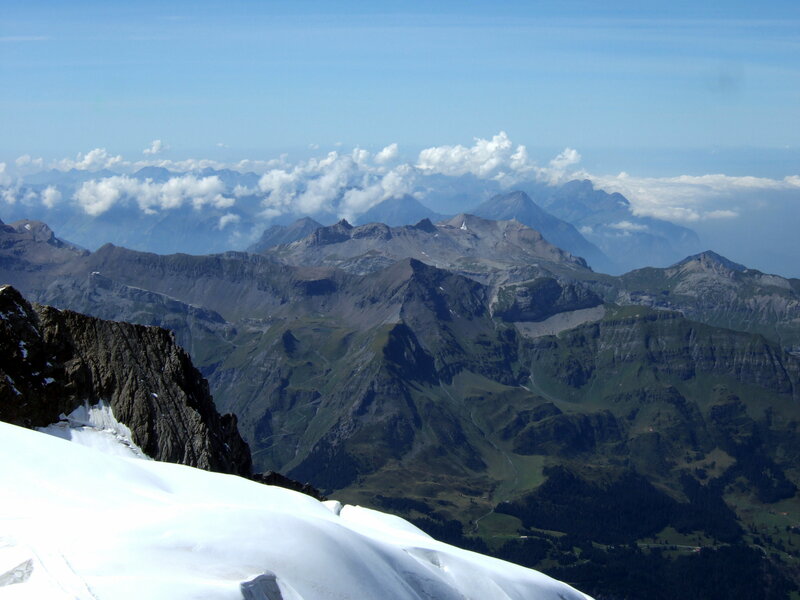 The views here are simply stunning with the Aletsch Glacier leading the eye southwards between rugged slopes towards the distant Pennine Alps across the unseen Rhone Valley while the Jungfrau towers beyond the area of the unseen station in steep rocky steps above the snowfields. The walk seemed shorter than I remembered – probably because of the weather – and the hut was soon in sight perched just beyond the lower end of the South East ridge of the Monch. 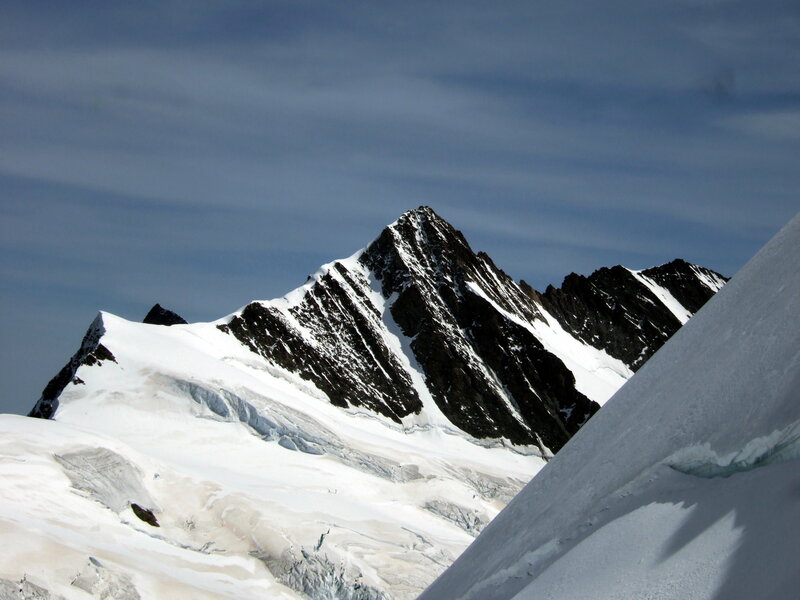 That is the normal route to its 4099m summit but though not far, it is not without difficulty and a guide is to be recommended for less proficient climbers such as the author. 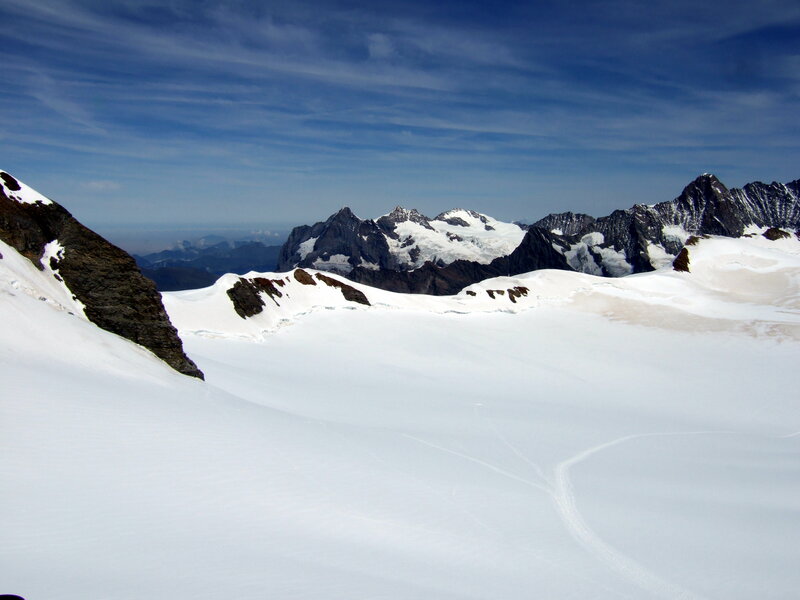 The view opened out from the hut and immediately on its far side was a steep drop to a wide plateau of snow with distant blue mountains rising beyond the multi peaked top of the Wetterhorn itself at the same level as the hut. To the right and closeby rose the icy crest of the Fieschhorn though the Eiger was hidden behind the eastern slope of the Monch. I bought a drink in the hut – tea in a bowl which is how they serve it in the huts – then sat outside in the sun enjoying its warmth and the wonderful high mountain environment around me. People milled around the hut as more struggled up the easy snow ramp leading to it bemoaning the lack of air. How different it was from last september when there had only been 2 people here – myself and the warden of the hut – and the challenge was in finding the route not a place to sit. Amazing views today though. 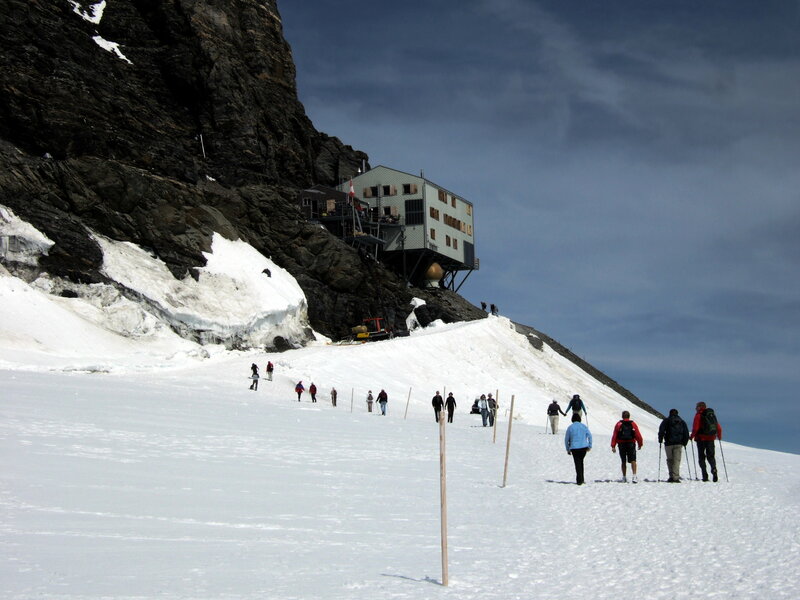 I made my way back to Jungfraujoch easily enough and having missed out on a curry was sorely tempted by the summer skiing – 33 francs including hire of skis. The run was a gentle easy slope which is about my standard – and a button lift pulled people back up to the start. I decided to save my money though and investigate the Sphinx Observatory and viewpoint – the silver dome I had seen about 400 feet above on a rocky tower which is accessed by a lift from the station. The lift is free and rises at terrific speed in a rocky shaft – actually 6.3 metres per second which is fast for a lift – to the observatory. The exit at the top of the lift is into a large room with glass walls and the view from here – though at 3570m slightly lower than the hut – is even more far reaching. A vast drop off close at hand to Interlaken and the Brienzersee – or Lake of Brienz – glittering below the cloud layers 10 000 feet below. Range after range of lower mountains spread out to the West while in the far distance hazy hills marked the Jura and southern Germany’s Black Forest maybe 100 miles away beyond the green Swiss Mittelland. 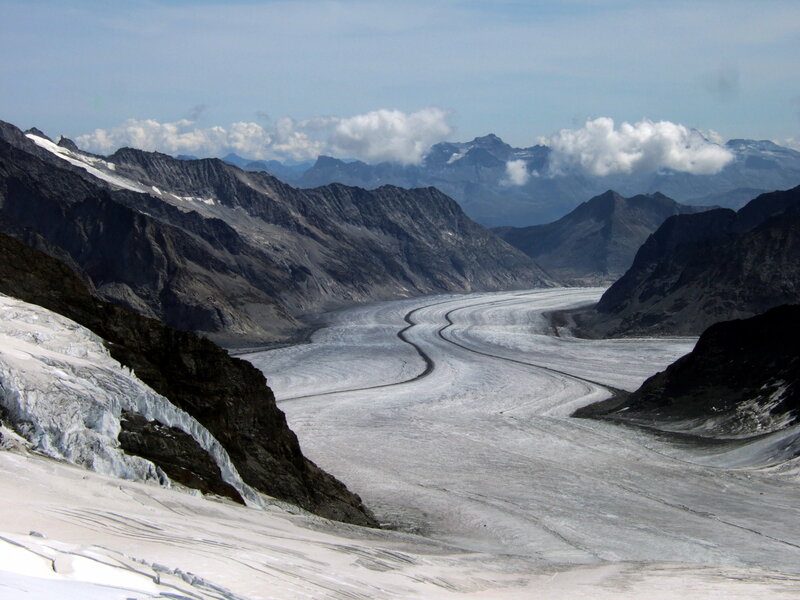 On the other side in great contrast was the Aletsch Glacier leading down from the world of ice immediately below. Outside the floor is one of those see through vertigo-vision metal ones that add to the excitement of walking above the void below and the whole structure is surrounded by a network of cables which were being used as perches by the ravens. I wondered what these were for then realised they were protection from lightning. Storms are frequent here and this faraday cage would prevent lightning hitting the observatory – or worse – anyone stood out here. Time to go down and I had a quick look at the Eisplast or Ice Palace and the Ice Plateau both of which which me and Dad had visited when we came up on a family holiday when I was 9. The plateau seemed much smaller than I remembered though the view was still stunning. The Ice Palace was just as cold as I remembered – perhaps -10 degrees being under the glacier – and is full of ice carvings some very intricate. There are similar man made ice caves at Klein Matterhorn above Zermatt and at Mittelallalin at Saas Fee and on the whole I would say that the one at Jungfraujoch is the most extensive and impressive. With that I went to board my train down from this land of ice and snow to the green meadows and trees of summer in the valley below – having missed out on a curry I would have a pizza in Grindelwald sat outside on a terrace in the sun before I walked back up the hill to my hotel. This entry was posted in Switzerland and tagged Europe, mountains, nature, outdoors, photography, random, Switzerland, travel, writing. Bookmark the permalink. Hi Mike, I don’t live in the mountains myself – I guess that’s why I like travel so much… We had good weather that day but the time before there was a blizzard and could see ten yards! This brings back some memories. I climbed the SE ridge from the hut with a guide back in the late 1960s! An interesting sharp snow arete as I remember it. I remember it more for the fact that I stupidly forgot to apply any suncream that day. My face was a blistered mess the following day! Served me right! A well written story and some great images. I’ve not done that route myself – wouldn’t mind though. The sun is pretty strong up there and I must say that I did the same myself on the Le Tour glacier near Chamonix – bad sunburn! Thanks for the comment. Fantastic views of a great hike! Thanks – it was a good day out! 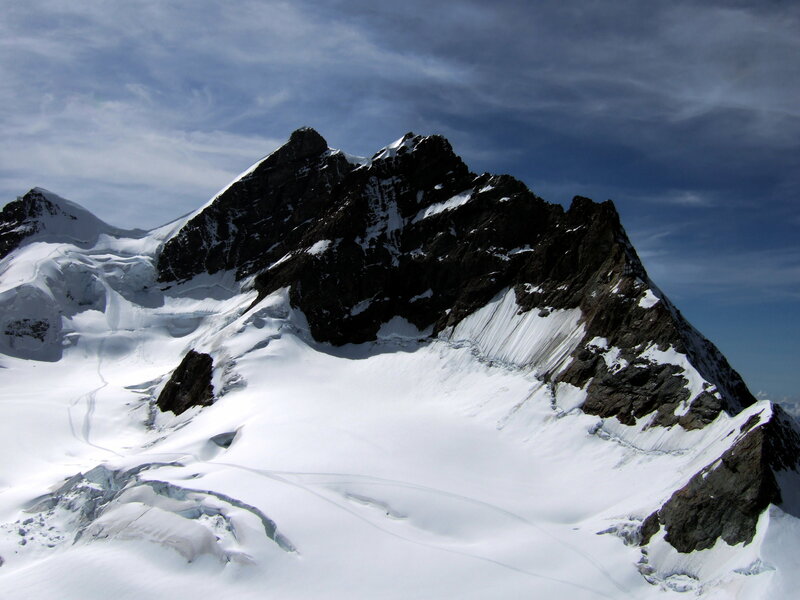 Hi Peter, I just came across this amazingly informative post of yours re: a day at the Jungfraujoch. I wonder – how long was your day? Ideally, my husband and I would love to do both the hut and the Sphinx Observatory (and the ice palace, if possible)…Thank you! 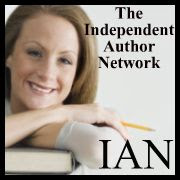 Hi Eleanor – glad you liked the post. The Ice Palace and the Sphynx Observatory are within the station complex so can be reached with no effort (Sphynx is reached by an internal lift from the station). 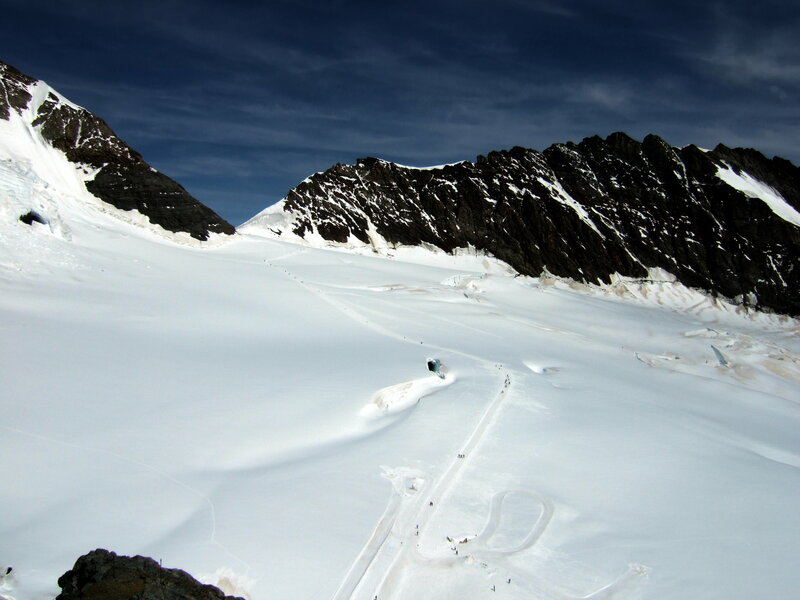 The hut is on the normal route to the Monch and involves a walk over a snow covered glacier but no technical climbing – the path’s like a ski piste. I guess it took half an hour to 40 mins to walk there and a bit less coming back downhill. The altitude is very noticeable heading there so it’s best to take it easy! Pick a nice day and enjoy some of the best views in Europe!